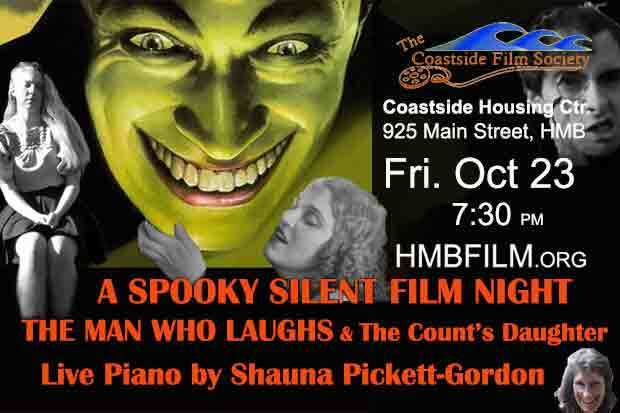 On Friday, Oct 23rd, the Coastside Film Society will be hosting another one of our Silent Film Nights. Given that this screening comes the week between Pumpkin Fest and Halloween we decided to book two silent horror classics. Our Feature is a swashbuckling melodramatic retelling of a dark Victor Hugo novel first screened in 1929. The opening act is a classic NEW silent short with a similar vibe created by a talented young local film maker. Come in costume and save a few bucks. Live Music by Montara’s own Shauna Pickett-Gordon. This is the seventh time that the Film Society has hired Shauna Pickett-Gordon to write a score for one of our Silent Film Nights & to play that score live on her piano during the screening. If you don’t know Shauna’s work check out excerpts from one of her earlier Film Night performances at the top of my Youtube.com/Podtactics channel. This silent short is from Johnny Villar, a 22-year-old Bay Area film maker/wunderkind. Created in homage to the 1920 silent films Johnny loves, it features a unique visual style and frightfully funny over-the-top performances. Winner of the “Best Acting” award at the 2013 International Youth Silent Film Festival. Johnny will attend the screening and introduce both films and take questions about silent films after the screening. Three years in the making, with a cast of thousands “The Man Who Laughs” was one of the most ambitions and unconventional silent films of all time. Universal Pictures hired the great German Expressionist film maker Paul Leni.to direct. The story is pulled from one of Victor Hugo’s best romantic novels.The result is a swashbuckling melodrama awash with deep shadows and harsh angles. A film unlike anything American audiences had ever seen before. It remains of the great romantic melodramas and a monument to the expressive power of the silent screen. German superstar, Conrad Veidt, plays Gwynplaine, who as a child has his face carved into a perpetual grin when his noble father slights the King of England. He lives as a travelling sideshow freak along with his adopted father and the beautiful, but blind, Dea. They fall in love, but Gwynplaine refuses to marry Dea because his hideous face makes him feel unworthy. When the current Queen discovers that a Lord of the realm is living as a freak she brings him into her court as part of one of her elaborate court intrigues.